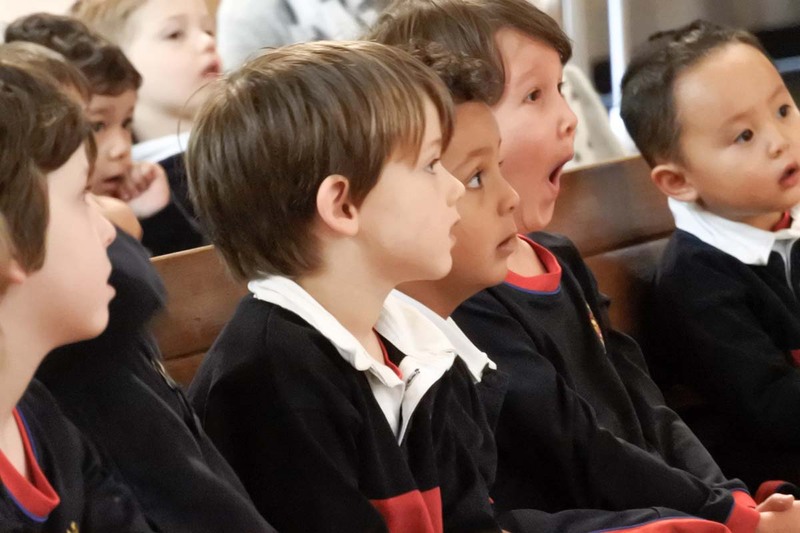 Father Tony was rugged up in his black robe, to keep warm, when the ELC4 boys (Wallabies and Bandicoots) arrived at St Andrew’s first-thing on Monday morning. But he quickly changed into his gold ‘party robe’, with its BGS colours and crest, because going to church is a kind of party where we celebrate that Jesus is here with us. 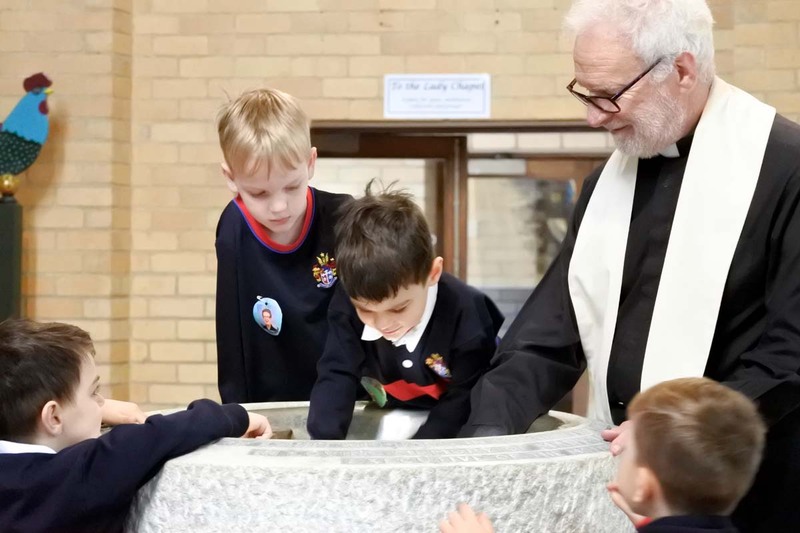 The boys were visiting with Father Tony for some Easter preparation but they were keen to remind him that they’d been inside St Andrew’s before, particularly for Christmas events with the ‘big boys’. They noticed that the ceiling is very, very high up and that there are many different pictures around the church. All of these pictures, said Father Tony, tell us something about Jesus or His followers; some pictures, like those that include the sea, tell stories about Brighton. 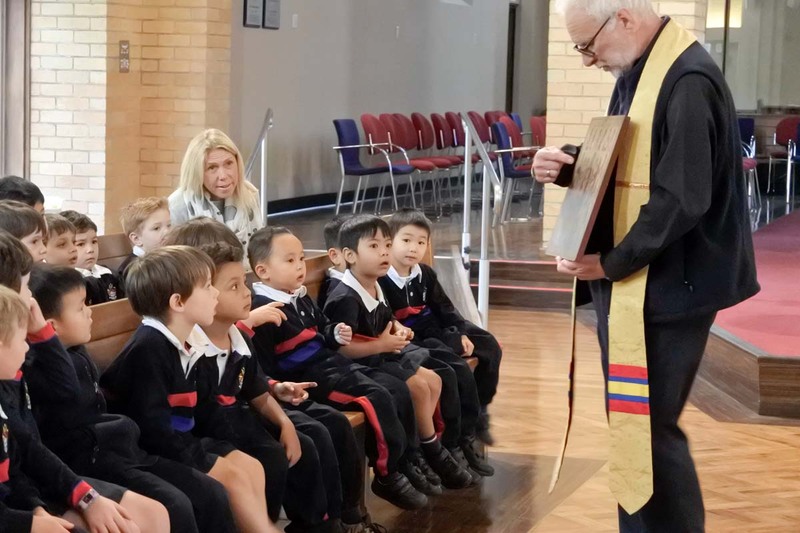 Father Tony showed the boys the Jesus Candle, with its alpha and omega to show that Jesus is the beginning and the end, and that all time belongs to Him. The boys were prompted to think about their own lives in context by considering the date on the candle; this year, the numbers say 2019, indicating that we are living 2019 years after the birth of Jesus. God didn’t die. Jesus died on Easter Friday, and Jesus was God – which is confusing! But Jesus came alive again on Easter Sunday. The big cross at the front of the church has no body on it because Jesus is alive. The robe worn by Father Tony is older than he is, and many of the items in the church are much older. The big font, with its cover and its plughole, was a source of fascination for the boys. Father Tony pretended to baptise one boy to show us all how it is done. Before long, there was a queue to step up to the font, look in and feel the pretend water. This procedure may not have been exactly what Father Tony had had in mind for his Monday morning, but the boys’ curiosity could not be denied. 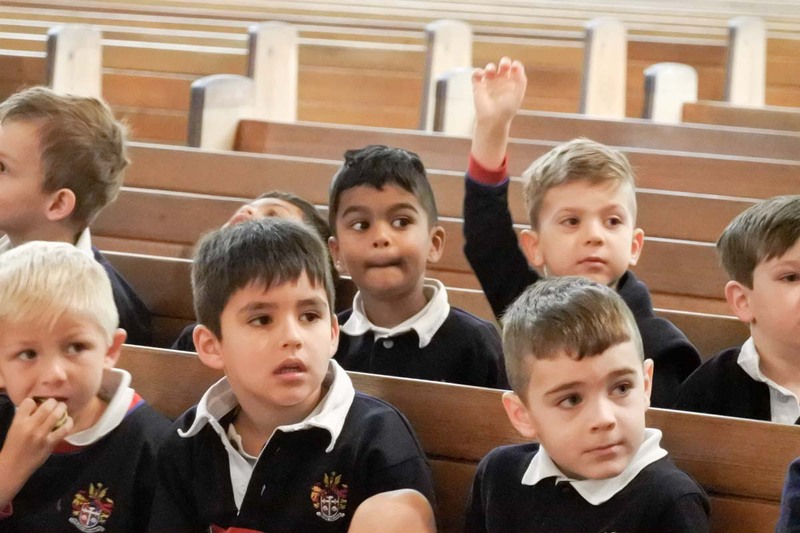 By the end of their visit, the boys seemed to feel quite comfortable in the church, although the quiet and respectful manner they maintained was very impressive. They were grateful to Father Tony for helping them to prepare for Easter. Their interest in the celebration now extends beyond chocolate as they look forward to celebrating life at BGS with Jesus.